We gave our selves a camera for christmas. The instructions contain 500 pages so we decided to just try it out. There are plenty of room for improvement but coming from me, this is a great picture. 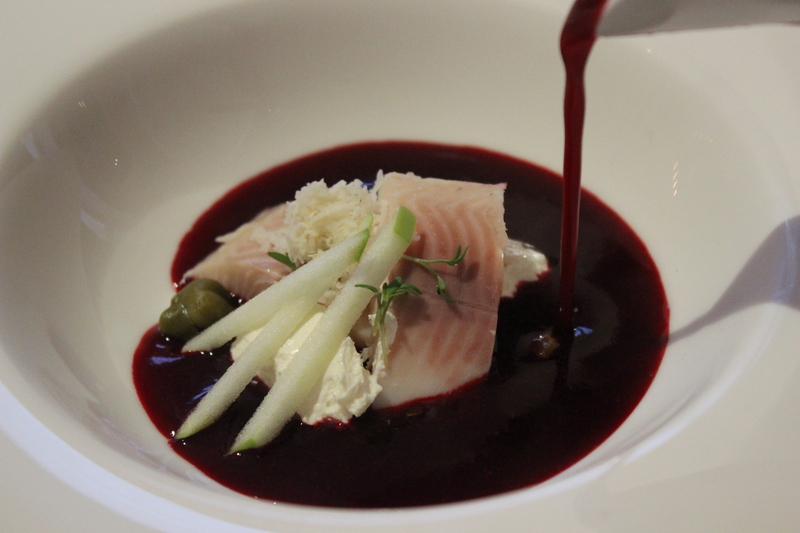 It is a very simple but delicious starter, inspired by the Russian Borscht. Start with the soup. Extract the juice from the beets in a juice separator. Heat with vinegar, sugar, salt and pepper. Add the starch for the right consistency. Let it cool and serve luke warm. Mix creme fraiche with half of the horse-radish. Cut the apple in baton and the fish in smaller pieces. Arrange fish, horse-radish, capers, creme fraiche, apple and cress on a plate. Add the soup. This entry was posted in Norden (Scandinavian) and tagged Beet root, smoked trout by Schmidt. Bookmark the permalink.